88 project from all over the world want to be IoT smarter and applied to JIC STARCUBE 2015. Majority of non-Czech applications come from India, Spain and USA. The finalists will be announced till the end of August. What are the projects about? Smart soccer training mat, city-citizen communication tool, pill dosage monitoring, pocket money watcher, cyber vandalism protection, supersafe file transfer technology, chair as a health tool, open sourced advanced information systems security, anti-hacking solutions to prevent massdefacements, tool for the balanced lifestyle of the pet and many others. Participants will be chosen on a one-day workshop that takes place in the second half of August. „A maximum of 30 teams will be invited according to originality of solution, potential to succeed on the market and the members quality. During the workshop we will focus on the team as one of the key aspects,“ says the startup manager Vojtěch Krmíček. The foreign teams can attend the workshop virtually. Partners of the accelerator as Flextronics, Konica Minolta or Microsoft will have an advisory vote during the selection as well as the main partner Y Soft who´s main interest are the project connecting hardware and software. „Our know-how gained in the last 15 years of global growth lies in this combination. The team leaders, global scalability and market validation will be also under our spotlight,“ describes the criteria of selection and following potential investment main partner of Y Soft Ventures Miloš Sochor. 32 countries, 5 continents. Only Antarctica is missing. 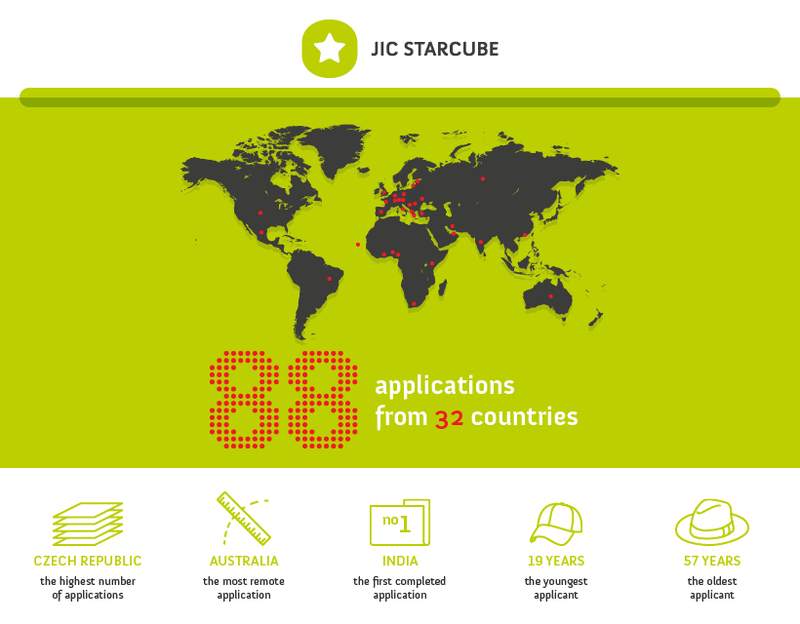 JIC STARCUBE received applications from 32 countries (covering all continents except Antarctica). The most non-Czech applications are from India. The first application was from India and the further one came from Australia. The youngest applicant turned 19 and the oldest is 57. For what do JIC STARCUBE alumni spend their money?